This was great fun to take to the zoo yesterday! 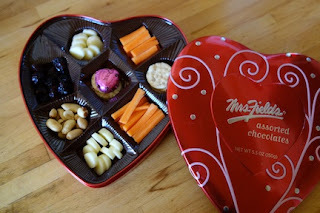 Valentine's Snacks! 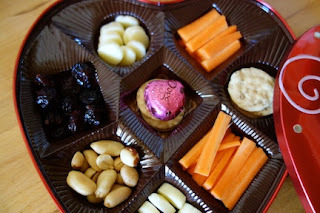 So many people have done this faux-bento holiday snack kit, but it's so appealing! This is one cheese stick, one carrot cut into matchsticks, about 8 mini-crackers, and about 1 1/2 tablespoons each of cranberries and peanuts. And a single chocolate heart. I made the mistake of not-saving the padded waxed paper sheet that came with the tin, which meant that when tipped sideways, everything could fall out of its well. So I cut some waxed paper and added a few napkins to add pressure while it was in my bag. In the future I'd like to put a sticker over the brand name. Didn't get around to it. Big hit! 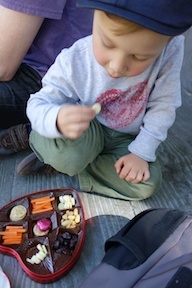 Starboy even ate some of the carrots. 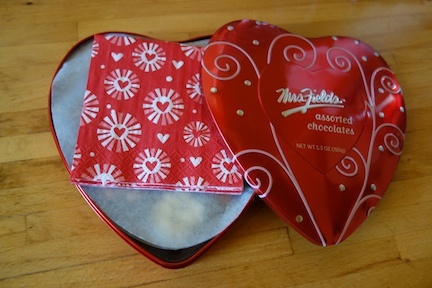 But the chocolate heart was the favorite part!